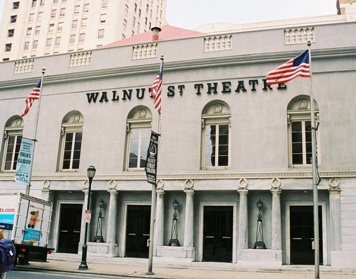 The Walnut Street Theater is the oldest continually operating theater in the United States. Since 1809 the theater has offered a stage for the biggest stars in America and from around the world. Helen Hayes, Harry Houdini, Jack Lemmon, George M. Cohan, George C. Scott and Katherine Hepburn have all performed here,and that is only a small list of luminaries. Thomas Jefferson and the Marquis de Lafayette attended the theater here. Others performing here include Marlon Brando, Henry Fonda, Groucho Marx and Audrey Hepburn. No other theater in the country can present such a renowned history. In 1964, the Walnut was designated a National Historic Landmark. A non-profit regional theater, the Walnut Street Theater is dedicated to the preservation and development of the art of theatre. As a non-profit theatre, the theater chooses and produces its own productions. Since 1983, Walnut Street Theatre has produced over 145 plays, including 23 world premieres and 10 American premieres.